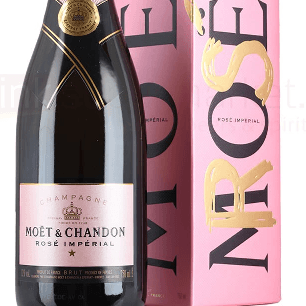 Champagne gifts Rose Moet Chandon. The assemblage, which is formed around Pinot Noir, is both spontaneous and balanced, emphasising fruity liveliness. It is zestful, with great suppleness. The assemblage with red wine also gives it a feminine, coppery taste. If this is a special gift you can pick the delivery date after you checkout. The elegance of Chardonnay: 10 to 20% of which 20 to 30% from specially selected reserve wines to enhance its intensity, subtlety and constancy.